Silver Steps™ toe straightening wraps gently support and realign to ease pain and pressure caused by crowded, overlapping or hammer toes. 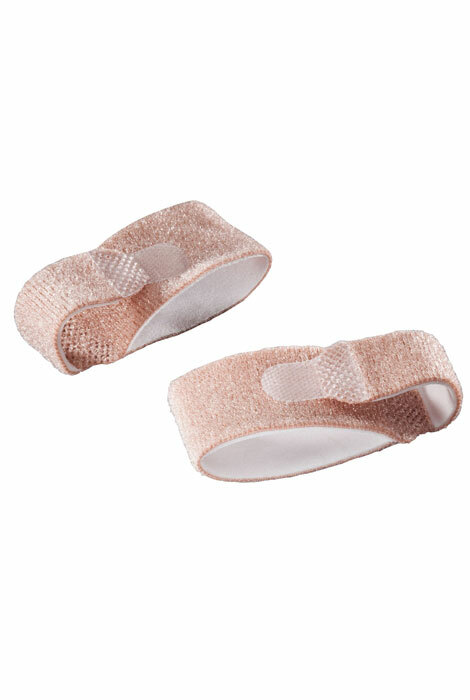 Soft, easy-to-apply foam relieves corns and calluses and is thin enough to wear with shoes. One size fits all. Set of 2; each 4 1/8" L x 15/16" tapered. Washable, nylon-covered polyethylene. So grateful this product exists. "Aging toes" do their own thing. I use this product to maintain my health. This is a nice product, but I was disappointed when I found it at the drug store down the street for $2.50 less than I had paid. I put this on my toes, however, I did not notice anything helpful about it. This thing probably does work for overlapping toes. Although the product overview says it is also for hammer toes, it does absolutely nothing to straighten my hammer toe. Hoping it will straighten my toes. Mom has hammer toe causing a callus that's painful. She hasn't tried this yet. I have trouble with these two toes separating, and I can't wear thongs. I will try them with these. The photo looked like what I had imagined I needed to correct my problem, rather than some other larger, more complicated foot braces I have seen. Have hairline metacarpal fracture. This product stabilizes for healing. I have a toe that is crooked and the one next to it is a hammer toe. Hopefully this will aid in less pain. I'm going on vacation soon and I have two toes on my left foot that could be closer together. I thought I'd try this item to see if it would help bring that two toes together. Help with my crowded toes to make wearing shoes more comfortable. I have ha me toes on my. Right toes and they separate and it causes problems so this tape out really well. I have 2 hammer toes, need some help, and these look like they might do the job! My mom has hammer toes and her toes are overlapping. She also has blisters on all of her toes, due to her toes rubbing against her shoes. I'm hoping this will provide her some comfort. I am also hoping this will keep her toes straight. I noticed that my toe was not straight and was starting to lean and cross over my big toe. Someone suggested taping my toes but that left my toes sticky. I thought I'd try the toe straightening wraps. My 4th toe is overlapped with 3rd toe to straight in. 2nd toe is slightly over the big toe. I want to straighten the second toe, getting some support from the third toe. Material too soft - kept slipping off toes. Uncomplicated and washable. Experimenting with products for crooked toes. I picked this product to help me with the toe pressure from my hammer toe.. I hope it relieves the pressure and helps my corn. Will it go around big toe? BEST ANSWER: Yes, I wrapped it around 2 other toes and it was still too large for me. Not as comfortable with shoes as I'd hoped.